My parents just returned from Europe a few days ago, and I like to pick their brain after a trip to see if they have any new hotel or sightseeing recommendations. They're retired, so obviously they don't look for kid-friendly accommodations or activities, but sometimes I get insight into a city or location that I can then investigate. They help fuel my hobby, if you will - researching European destinations. 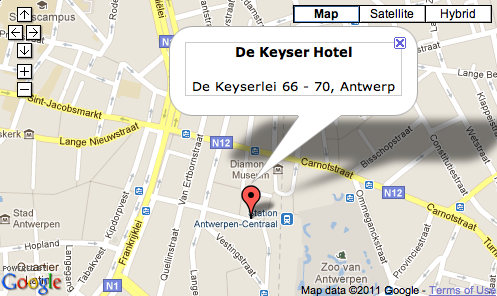 They were extremely pleased this trip with the location of their hotel in Antwerp, De Keyser Hotel. This recommendation should not be taken lightly, as you might recall that Antwerp, Belgium, is my father's hometown, and they have stayed there many, many times and know the city very well. 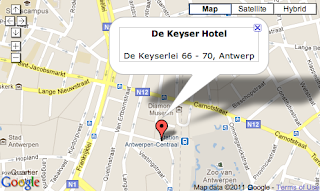 De Keyser Hotel is located right next to Central Station, which is right smack in the middle of town near the shops, restaurants, and city squares. Just about everything is an easy walk from there. I looked into family-sized rooms at this hotel and didn't find any. They do offer a suite which can perhaps accommodate a roll-away bed, but 4-person rooms are not available.